We live in a world where the technological evolution transforms our personal and professional lives in a profound way. Mobile devices are true extensions of our bodies, part of our daily lives. This transformation brings significant challenges for those organizations whose existence and efficiency are based on direct interaction with their customers. Extending customer communication channels and making them more efficient is one of the hottest topics today. Using mobile devices as communication instruments is currently a very interesting option given the maturity level reached by proximity technologies that give context to customer interaction. MobileRoute Proximity is a complete proximity interaction platform that opens the door to the new era of digital customer interaction. Based on the newest and hottest technologies – iBeacons and Cloud Computing – the platform supports a very broad range of interaction scenarios. Starting from the simplest approaches (like greeting the customer with a welcome message) and up to the highly complex ones (like real-time predictive marketing), proximity interaction promises to be become in the near future a highly valuable tool that you can use to communicate with your customers. To find our more about MobileRoute Proximity or schedule an on-site demo, feel free to contact us at contact@mobileroute.eu. 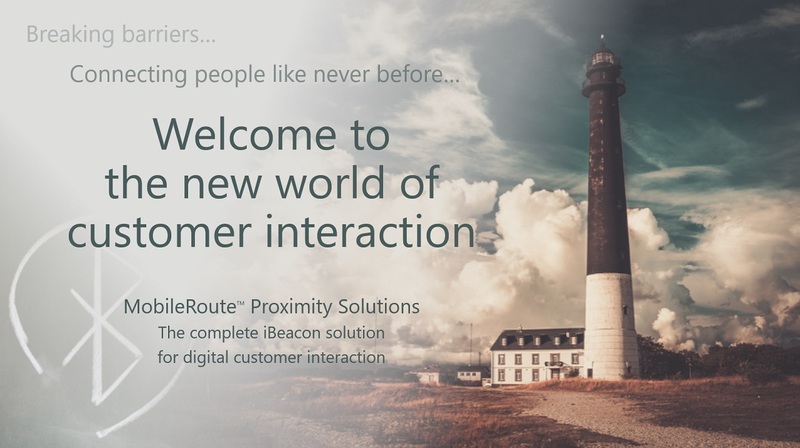 Welcome to the new world of customer interaction!